Diana Nyad has made landfall (hurricane humor, sorry) just moments ago, which means that the crowd gathered at Key West is right this moment cheering her for successfully hauling herself out of the briny deep. 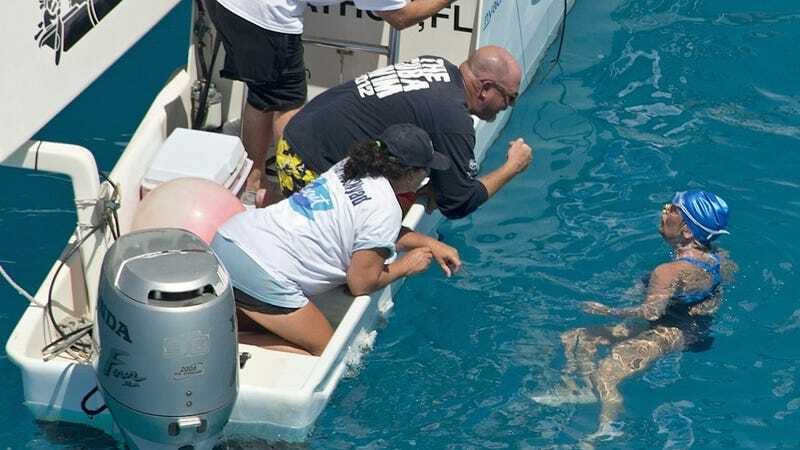 It took 35 years, but Nyad just became the first person ever to complete the dangerous 103-mile swim from Cuba to Florida without a shark cage (this was her fifth attempt, and her struggles achieving this superhuman feat are many and well-documented). She'd already broken Penny Palfrey's shark cage-free swimming record earlier this morning, and has logged about more than 48 hours in the water.